The key players in the global bio vanillin market are paying attention to quality of the manufactured products. The companies are also focusing on the new flavors and fragrances that can be utilized in the cosmetic sector, apart from the food and beverages industries. Givaudan SA, Solvay SA, Firmenich SA, Advanced Biotech, Evolva Holding SA, Apple Flavor & Fragrance Group Co., Ltd., Lesaffre, Aurochemicals, Archer Daniels Midland Company, and Borregaard are some of the leading players in the market. These firms provide a huge variety of products and this has helped them achieve a strong position in the global bio vanillin market. One major growth strategy adopted by the firms in the market is diversifying their product portfolio to up sales. The companies are also banking upon mergers and acquisitions to expand regionally. This is another major strategy adopted by key players to improve their market position. According to Transparency Market Research, the global bio vanillin market is anticipated to rise with a strong CAGR of 7.4% within the forecast period from 2017 to 2025. Based on application, the market is led by food industry, which accounted for a significant 50.82% share in it in 2016. On the basis of geography, the market is dominated by Europe. The region accounted to over 33.14% share in the market in 2016. The major factor propelling the growth in the region is environment-friendly property of bio-based products. Europe is foreseen to keep on leading the market within the forecast period from 2017 to 2025. However, in terms of volume, Asia Pacific dominates the market. The global bio vanillin market is boosted by increase in demand from the food and beverages industry. 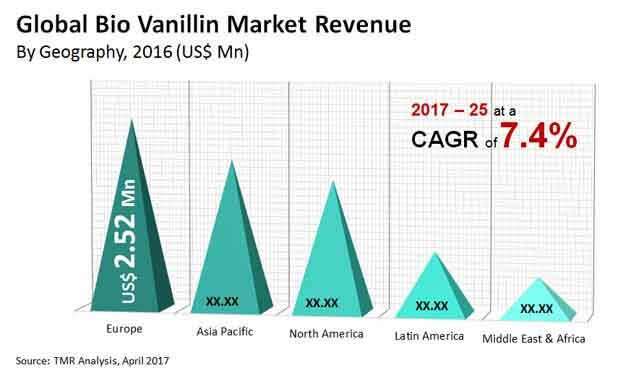 The mentioned industry is flourishing all over the world, which turns out to be a positive news for the global bio vanillin market. The advancement in technologies in the food and beverages industry, along with change in food preferences of the people are expected to spur demand in the industry. Owing to this demand for bio vanillin, its market is anticipated to rise s in coming years. Nations which have very high population, for example Indonesia, India, and China, are likely to experience a growing food and beverage sector, which will fuel the market demand for bio vanillin. The adoption of organic foods is another factor responsible for the market growth. Another encouraging factor supporting the high market demand is better quality standards set by the Food and Drug Administration (FDA) and the European Food Safety Authority (EFSA) regarding food safety. The synthetic vanillin has low price. This factor is foreseen to hamper the market growth. This is so, because the synthetic vanillin can replace bio vanillin. The production of organic vanillin needs a lot of labor and hence, it turns out to be costly. This factor is also a hindrance in advancement of the market. However, in coming years the market will pick pace once it passes its nascent stage.